After the blaugranas booked their place in the Copa del Rey final on Thursday, Valverde’s side maintain their undefeated La Liga run with a 0-0 draw against Getafe at the Camp Nou. The blaugranas tried to break the visiting side down throughout but were unable to unlock the defence despite chances for Suárez, Yerry Mina and Coutinho. Getafe started by pressing very high up the pitch and Ter Stegen had to produce a fantastic dribble to avoid being dispossessed on his own goal line. 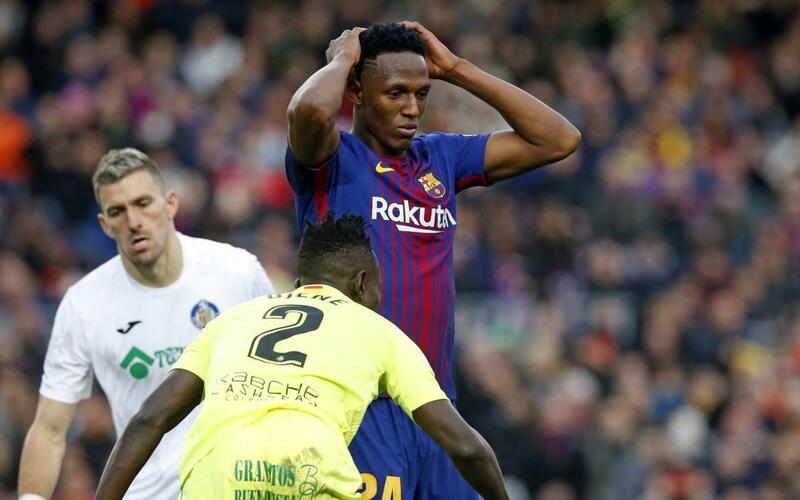 As the first five minutes went by Barça’s new look backline, including Yerry Mina on his home debut and Lucas Digne as the centre-backs, began to play the ball out from the back. However, the blaugranas weren’t completely comfortable with Getafe threatening on the counter through Ángel and Ndiaye. Ter Stegen was quick off the line to sweep up on two occasions. Busquets, on his 300th appearance for the club, was playing with his customary calmness and he showed some nice touches at the base of midfield. In the 17th minute, Barça worked the ball to Messi, who was moving at full speed in the box when he was body checked by Bruno. This was the closest Valverde’s side had come to troubling Guaita’s goal. Getafe have the third best defence in La Liga and FC Barcelona needed to up the pace to unlock a well-drilled team. Sergi Roberto tried to create some space down the right and he almost got past the defence before losing out to Ndiaye in the box. In the 31st minute, another good spell of possession from the home team resulted in Coutinho feeding Rakitic who crossed to Leo Messi. Just as the Argentine was about to pull the trigger Damián nipped in to clear as Barça started to look more threatening. Getafe then had their best chance of the game so far as Ángel went one-on-one with Mina. He managed to make space for a shot which whistled past Ter Stegen and the post in the 40th minute. Barça responded two minutes from half-time as Messi dribbled past two players and was brought down. He swung in lovely free kick which Suárez finished well but he was flagged for offside. Following the break both sides looked to break the deadlock with Coutinho shooting from distance and Ángel saw a shot blocked when his teammate was better placed. Soon after, Busquets was booked for a foul on Ndiaye. Barça went up a gear as they searched for an opener. Alba, Alcácer and Suárez combined very well down the left and it ended with the Uruguayan toe poking a poor clearance just wide on 55 minutes. Two minutes later, Coutinho came to life and curled a delightful shot on goal which Guaita saved excellently. Valverde brought on Iniesta and Dembélé for Coutinho and Alcácer 62 minutes in. The captain showed of his skills as he took the ball from Alba, nutmegged Antunes and crossed. However, the Getafe defence cleared ahead of fellow sub Dembélé. The blaugranas continued to push but Getafe’s defending was excellent and they brought on defensive midfielder Flamini for their number ‘9’ Ángel. New boy Yerry Mina attacked a corner and his wonderful header bounced wide of the post in the 77th minute. Paulinho came on for the classy Busquets as Valverde brought on a more attacking presence. Messi had the ball in dangerous positions on a few occasions but he was well marshalled by the visiting defenders who didn’t give him any time or space. Iniesta swung in a dangerous cross but Guaita came out to claim it. Dembélé then crossed in from the right and Suárez rose above two defenders to direct a header goalwards but once again Guaita saved well. However, despite the home side’s insistence there was no way through the yellow wall. Barça’s unbeaten La Liga run this season continues but they were unable to secure three points at home meaning they are on 59 points with Atlético on 52.